Women as well as hair styles are constantly changing. It's tricky to keep a step ahead fashion. When it comes to clothing and accessories New York, London, Milan and Paris fashion shows are the ones to dictate what's hot and what's not. The latest beauty trends for Spring Summer 2013 in terms of cuts, colours and hairstyles come directly from the catwalks, as designers employ the best hairdressers and hair stylists of the industry to offer unique and edgy looks. 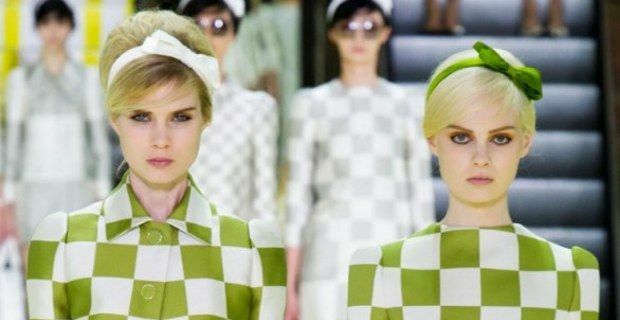 Many of Spring 2013 hairstyles have been inspired by the icons of the past, on one side we find vintage Sixties style haircuts, like those worn by Louis Vuitton's girls, on the other the craziest trends of the rock stars of the Eighties. Also in vogue this season Heidi plaits, to wear with an up do or with hair down in a plaited headband, architectural and minimalist buns or textured pony tails. Next season is all about romantic hairstyles, undone hair wrapped up in the cutest hair accessories, such as Dolce & Gabbana's colourful scarves and Miu Miu and Cacharel's precious Alice bands. At Paris fashion week Miuccia Prada's models were wearing delightful, ultra short fringes, seemingly badly cropped, but very difficult to maintain. Vivienne Westwood and Yohji Yamamoto offer an edgier look, characterised by ruffled, two-tone mops, typical of the punk bands of the Seventies and the rock stars of the Eighties. The trendiest colours of Spring Summer 2013 will be amber red, light blonde and honey-blonde, and natural light brown. Forget rich, crazy tones, next season is all about natural shades, which have to be styled very originally. So hands on a pair of scissors and start chopping and cropping. And if you don't feel brave enough, Gucci's asymmetrical fanned out bun will do the trick.